WASHINGTON (AP) - Minority renters and homebuyers deployed to test for housing racial discrimination today did not run into the blatant discrimination of four decades ago, but were told about and shown fewer homes than their white counterparts with similar backgrounds, according to the results of a major federal housing study released Tuesday. The Department of Housing and Urban Development deployed pairs of testers - one white, one minority in each pair - to do more than 8,000 tests separately across 28 metropolitan areas in the $9 million, study the Obama administration conducted last year. Testers' were the same gender and age and presented themselves as equally qualified to rent or buy a unit in the study whose results were released Tuesday. The blatant discrimination of literally slamming doors in the face of minorities and other racial groups that was found in a similar 1977 HUD study was less evident: minorities usually were able to get appointments and see at least one unit last year. However, blacks and Asian-Americans were treated differently than white counterparts often given fewer options. Hispanics were also treated differently when renting, however, experienced about equal treatment as whites when seeking to buy a home. "Unfortunately, our findings reveal a sad truth - that the long struggle to end housing discrimination remains unfinished," HUD Secretary Shaun Donovan told reporters in a telephone news conference. In one case, an Asian tester was first to see an agent about a two-bedroom unit advertised for rent. She was told it was available and was able to see it, but no other units were made available to her. A couple of hours later, a white tester saw the same agent and the same advertised unit, but she was told about four more two-bedroom units that were available in other places. "That's typical of the kind of unequal treatment we observed across metropolitan housing markets nationwide," said Margery Turner, senior vice president for program planning and management at the Washington-based Urban Institute. "It's fundamentally unfair somebody would get information about fewer homes and apartments just because of the color of their skin. But it also really raises the cost of housing search for minorities and it restricts the housing choices available to them," Turner said. Donovan added that that the discrimination affects minorities' ability to move to a community with a good school, denying their children the best education; to move to safer neighborhoods or relocate to an area with job openings, thus affecting financial security. "I stress that the findings of this study are more than just numbers. They represent families being denied their fair shot of the American dream," Donovan said. Turner said paired testing can't capture all the forms of discrimination that might occur. Also because testers presented themselves as unambiguously well qualified for the apartments, the results don't reflect the average minority home seeker. The study's findings probably understate the level of discrimination occurring, she said. Study authors said enforcement of housing discrimination laws cannot rely heavily on victims' individual complaints because the type of discrimination seen in the study is virtually impossible for a victim to detect. - Black testers wanting to rent were told about 11.4 percent fewer units and shown 4.2 percent fewer. 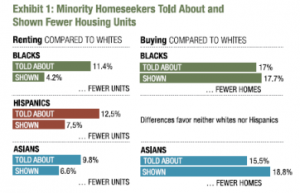 Black testers wanting to buy a home were told about 17 percent fewer homes and shown 17.7 percent fewer homes. - Hispanic testers were told about 12.5 percent fewer units to rent and shown 7.5 percent fewer. There were no statistically significant differences in the number of homes shows white testers compared to Hispanic testers. Authors said, that finding reflects a long-term decline against Hispanic testers wanting to buy homes. - Asian testers were told about 9.8 percent fewer and told about 6.6 percent fewer rental units. They were told about 15.5 percent and shown 18.8 percent fewer homes to buy. The country has a long legacy of pushing minorities in to certain neighborhoods and denying them access to those reserved largely for whites, thus creating racially segregated communities, many of which continue today. A string of tactics have been used from writing covenants that restrict the buy or sale of property to people of a certain race or ethnicity to financial institutions refusing to provide loans to minorities. Predatory lending that has been blamed in part for the most recent housing crisis was often targeted to racially segregated neighborhoods. "We should not be under any illusion the job is done. The message clearly should not be it is time to relent on fair housing activities," Donovan said.